Need a Laugh? Watch this Cheese 80s Music Video with the music removed and overdubbed! This is a few years old, but I just discovered it. 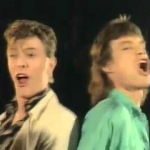 Someone removed the music to ‘Dancing in the Streets,’ from David Bowie and Mick Jagger and put ridiculous SFX and overdubs in it! Brilliant. Enjoy!